signed lower centre: F. POST. 28.2 by 41.9 cm. ; 11 1/8 by 16 1/2 in. In the collection of the family (Portugal) of the present owner for at least four generations. 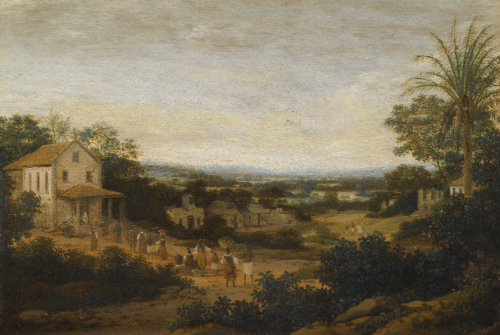 As far as is known, Post painted nothing other than views or capriccio views of Brazil, the country where he spent seven remarkable years between 1637 and 1644 with the Dutch colonists under Prince Maurits. While only seven paintings (and some drawings) survive from his time in Brazil, from what was a much larger body of work, during the remaining 36 years of his life back in the Netherlands he drew on his recollections from his Brazilian sojourn, evoking for his clientele a sometimes literal (from drawings) but more often partly imagined view of a distant land that must have seemed as alien to them as it did to Post on his disembarkation there in 1637. Post continued to provide such works for an avid collecting public until the final year of his life and this painting, which came to light only at the end of 2010, has been dated by Pedro Corrêa do Lago to the beginning of the so-called 'fourth phase' of Post's production, circa 1670. It retains much of the brilliance more usually associated with Post's 'third phase' (1661-1669), such as the beautifully observed vine creeping over the rocks in the foreground and the wonderful array of well-crafted natives and Europeans making their way to the church. In terms of composition, execution and technique the work is perhaps best compared with two other views of the marshy plains (called varzea ), one dated 1664, the other 1665. (1) With the 1664 dated work in the John and Mable Ringling Museum, Florida, it shares both a composition built along remarkably similar lines and similar foreground detailing. This compositional type is one oft-repeated in Post's works of the 1660s and 1670s creating as it did a wonderful sense of depth, the eye being led down from the higher ground, dominated by the heavy shades of closely observed flora, to the lighter tones of the distant village and lower marshes. from his time in Brazil. (4) The tonality of the sky is common to Posts from the mid-1660s onwards and it seems probable that the appearance of the sky now is close to its original intention; amongst numerous examples manifesting the seemingly afternoon hues present here are the 1664-dated Ringling view and, into the fourth phase where the effect is more common, the Ruins of Olinda cathedral (Fundaçao Maria Luisa e Oscar Americano, Sao Paolo), (5) and paintings in private collections in Brasilia and Sao Paolo; (6) however there may be some degree of smalt degradation in all of these works. The panel here is bevelled on the lower and right hand edges (as viewed from the reverse), which is typical of panels from Post's mature period. It seems likely that he commonly cut four smaller panels out of one larger. Following first hand inspection, the attribution has been fully endorsed by Pedro Corrêa do Lago and Frits Duparc. 1. See. P. & B. Corrêa do Lago, Frans Post, Brazil 2007, pp. 238-9, nos. 75 and 76. 2. Ibid, p. 303, no. 122. 3. Ibid., pp. 306-7, nos. 125, 126. 6. Ibid., nos. 126 and 146.